Some time ago, we’d posted here about the wonderful twisted willow trees in the “Outback Trail” in Glen Canyon Park that are threatened with removal. Recently, we learned about the “Creek to Peaks” trail planned to connect Glen Canyon to Twin Peaks. 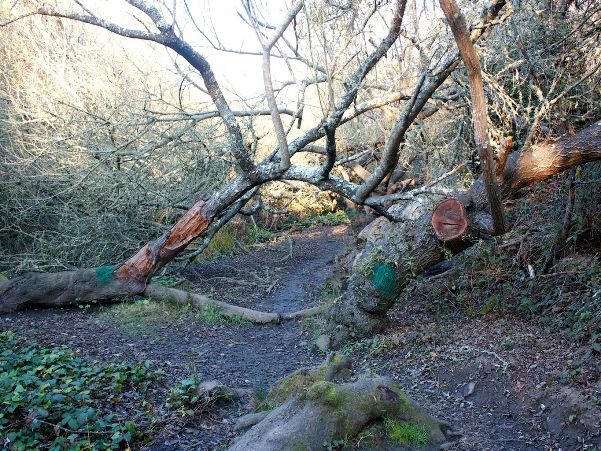 At present, it looks as though the planned trail would drive right through this unusual and beloved trail, completely destroying its quirky character. The San Francisco Examiner interviewed an SF Forest Alliance member about it. Janet Kessler pointed out that the trail did not need to go through this very special area or destroy habitat on which the wildlife of the canyon depend. leave Glen Canyon as it is! There are too many organized groups that are planning to change our city without the approval of the general public. The process now is to directly lobby the city officials to achieve their agendas. When corporations and financial organizations lobby, the public becomes understandably upset. We should take the same offense when organizations of advocates of any stripe goes behind public approval and even knowledge to achieve changes that the public would disapprove of if we were inside the loop. The Natural Areas Program, Transform, the Bicycle Coalition, etc. are all good examples of this process. Let us insist that controversial changes to our city be put to referendum before any such changes are made. “Natural” means natural! I am totally disgusted with the NAP as it seems to be constituted. The trail proposed through Glen Canyon does not leave the Park “natural”– it leaves the Park with crew-cuts, a shaved creek, murdered trees. STOP THEM! Webmaster: Please help us stop them by signing our petition. Please go to our home page and click on the link to our petition. You can also print a copy of the petition, circulate it amongst your friends and mail it to us before April 27th. Thank you for your comment and for any help you can give us.